The single thing I’ve implemented since the previous post is palette rendering, also known as indexed color rendering. If you’ve been using computers for longer than ~15 years or played games on an old-skool 8-bit console such as the NES, you probably have some idea what indexed color is about. For everyone else, grandpa will quickly explain ;-). Long ago, before we had smartphones, VR headsets and 4K screens, computers were pretty bad at displaying graphics. At first, they could not even display anything but monochrome images, using some hideously low resolution like 320x200 pixels. Or even less, if you go back far enough. As time progressed and computers got more widespread use, for example for games, they got better graphics capabilities. As you may have guessed, computers didn’t go from monochrome images straight to the (practically speaking) unlimited 32 bits-per-pixel color fidelity any run-off-the-mill computer or smartphone supports today. At first, most computers could only display a handful of colors, and often even just a subset of them at once. For example one of the first PC graphics cards, IBM’s Color Graphics Adapter (CGA) only supported 16 colors, of which only 4 at once could be displayed at the same time. Similarly, the Nintendo NES was capable of displaying 64 colors, but only in arrangements of 4 per sprite or background tile. This is where palettes come into play. Internally, these old computers stored pixel values using bit planes or packed pixels, where one byte of video or sprite memory encoded for several pixels, to conserve memory. 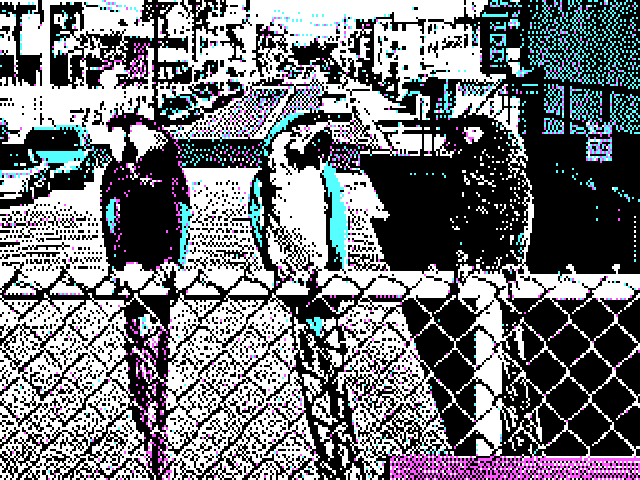 For 4-color CGA modes 2 bits per pixel where stored, or 4 pixels per byte. It would be a little too involved to exactly describe how NES graphics work and how you could coax it to get many colors on the same screen at once, but fundamentally it also uses 2 bits per pixel for sprites and background tiles. 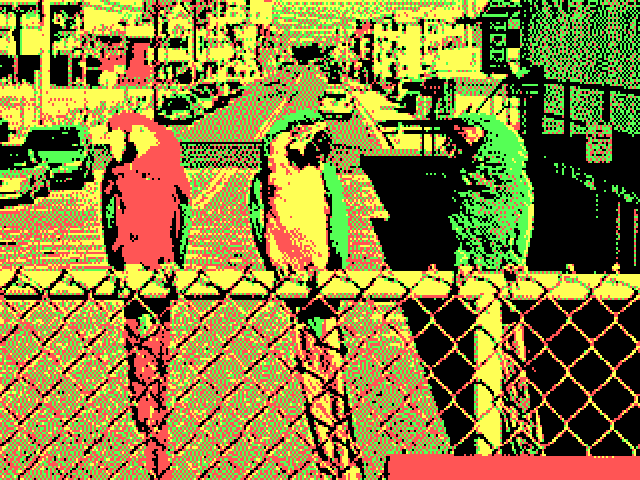 So how do we get from 2-bits per pixel, to one of the 16 (CGA) or 64 (NES) colors supported by the video hardware? Palettes! All of the game sprites are created as bitmap textures which means their colors are hard-coded at compile time. Depending on the theme and color of the planet they are used on, we may want to have different coloring of the same entity though. For example a red/yellow turret would be a little out of place on a green plane. We could store different versions of the same texture for each entity, each colored differently, but this would be wasteful and bothersome. It would be much nicer if we could store each sprite frame once, and re-color it at runtime. Classic games that had to use indexed colors by necessity employed all kinds of nifty palette tricks to achieve various visual effects, for example palette rotation and swapping. 2k14: The Game is in a sense also an old-fashioned game with a retro-style, so we would like to use the same kinds of tricks. Palette swaps can for example be used to flash a sprite when it is hit, to pulsate its color, etc. Quite a bit a of text just to introduce the concept of palette rendering. By now, writing all this up already took me longer than to actually implement palette rendering into the game ;-). Fortunately a description of the implementation itself can be pretty concise. As mentioned before, modern computers, including any smartphone sold less than about 10 years ago, support direct 32-bit RGBA colors. Palettes are still relevant in the context of indexed-color image formats, but there typically is no hardware support for indexed color render whatsoever. Fortunately, we now have something much better, which is programmable GPU shaders, which allow us to very easily emulate palette rendering. For 2k14: The Game I wrote a very simple fragment shader that performs per-fragment color swapping of the sprite texture. The shader works by mapping the color channels of the sprite texture to a three-bit number, where each bit corresponds to a color channel (red, green, blue) of the sprite texture. This gives us 8 color codes, which are used to lookup colors in an 8-pixel wide texture, the palette texture, the columns of which encode the RGB values corresponding with each of the 8 color codes. Multiple palettes can be encoded into the same texture, one for each row, which can subsequently be indexed using a palette index which is transformed to a row in the palette texture. For the time being, the size of the palette texture is required to be 8x8 pixels, giving us 8 palettes of 8 colors each. Because the palette bitmap needs to be re-submitted to the renderer whenever the palette changes, I needed a way to notify the view controller whenever the K14Planet palette property changes, so it can submit a new palette texture to the renderer. I added a very simple class K14Timestamps which stores the timestamps at which a named property is either read or written and flags them as ‘dirty’ when their write timestamp is ahead of the read timestamp. Using Key-Value Observing, clients can register a K14Timestamps insntance to receive callbacks whenever a named property changes, to automatically update the write timestamp stored for the property. To be able to synchronize the K14Timestamps class with the elapsed game time, the elapsed and elapsedTicks properties of the K14Game class have been moved into a new class K14Clock, which is passed on construction of a K14Timestamps instance to access the current game time when a property is read or written. Still on my list are particle effects, so that’s what I will be working on next. All of this was pretty straightforward to implement, estimated development effort was about 4 hours for a total of ~284 hours. Native code SLOC count increased by 114 to 7685 lines in total. Lua SLOC count increased by 2 because a palette index field was added when creating the sprite dictionary for some entities, and is now at 673 lines.